Recent statistics show that many MDG targets are already met, such as increasing access to improved drinking water sources. Despite improvements in the lives of millions of people around the world, the United Nations today reported that persistent gaps between promises made and those delivered by developed countries are holding back greater progress on reaching the eight anti-poverty targets known as the Millennium Development Goals (MDG) by the end of 2015. “I call on all Governments and international institutions to continue strengthening the global partnership for development so that we can usher in a more sustainable future,” Secretary-General Ban Ki-moon said on the launch of the new report. He urged leaders and citizens to “boldly step forward” to eradicate poverty, raise living standards and sustain the environment. Recent statistics show that many targets are already met – such as reducing poverty, increasing access to improved drinking water sources, improving the lives of slum dwellers and achieving gender parity in primary school. 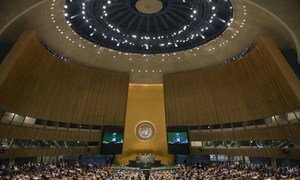 According to the report, “The State of the Global Partnership for Development,” progress on other MDGs, however, has slowed. The report, produced by the MDG Gap Force Task Force which is co-chaired by the UN Department of Economic and Social Affairs and the UN Development Programme (UNDP), tracks delivery on commitments listed under MDG 8. That target focuses on the global partnership for development, including aid, trade, debt relief, access to essential medicines and access to technologies. “With only one year ahead, we definitely need a strong sense of urgency and action,” Wu Hongbo, Under-Secretary-General for Economic and Social Affairs, told journalists in New York. For example, despite a rebound in official development assistance (ODA), the gap between the Goal 8 targets and policy delivery remains wide, the report notes. The commitment of 0.7 per cent of donor country gross national income (GNI) is estimated at $315 billion, but in 2013 an estimated $135 billion was delivered leaving a $180 billion gap. In market access, the authors reported that the Group of 20 (G20) major economies reaffirmed to refrain from protectionist measures, but created new trade restrictions in 2013 which “could undermine confidence” in their commitment to an open and liberal trading system. Among other points in the report, the authors noted that technological access for developing countries is growing at a fast pace. In particular, mobile phone usage, whose subscribers in the developing world will reach 78 per cent by the end of the year. Yet, while Internet use is spreading at a faster rate in developing countries than developed nations, more than four billion people are still unable to go online. While mobile-broadband penetration in 2014 is expected to reach 84 per cent in developed countries, it barely exceeds 21 per cent in the developing world. The report also highlights the prices of essential medicines, which are three times more expensive in the public sector than international reference prices and five times higher in developing countries’ private sector. These are some of the discussion points as the international community will prepare the post-2015 sustainable development agenda. According to Magdy Martínez-Solimán, UNDP Deputy Assistant Administrator, these are among the “so-called unfinished business” that has to be and which will be the core of the next agenda. “This is the legacy where efforts have been made, successes have been earned but there is still a journey ahead,” he told journalists in a press conference. Also participating in today’s press conference on the launch of the report were Thomas Gass, Assistant Secretary-General for Policy Coordination and Inter-Agency Affairs, and the Director of Development Policy and Analysis Division at DESA, Pingfan Hong.